I was given a zoodle maker recently and I'm very much in love with it! Peanut sauce drizzled over zucchini noodles with cilantro, tofu, and peanuts, is fresh and delicious. Thank you Arnetta! You're the BEST! Make 1 batch of baked tofu and set it aside. For the sauce, stir ingredients together in a bowl with a spatula or spoon until thoroughly combined and smooth (or you can blend it up using a blender). Add another 1/2 to 1 tbsp of water if needed (depending on desired thickness). If using pasta, fill up a large pot with water and bring to a boil. Add pasta and cook for TWICE the amount of time the box tells you to do. The biggest complaint about whole wheat pasta is that it tastes like cardboard. This is mostly due to the fact that it isn’t cooked enough. Cook the pasta! If you have a spiralizer then you can use it and get the job done quickly. If you do not then you can just as easily use a vegetable peeler to make long thin strips with your zucchini (and/or yellow summer squash) and carrots. Wash cilantro and remove leaves from stems. Divide whole wheat noodles, if using, and the carrot and zucchini zoodles into four. 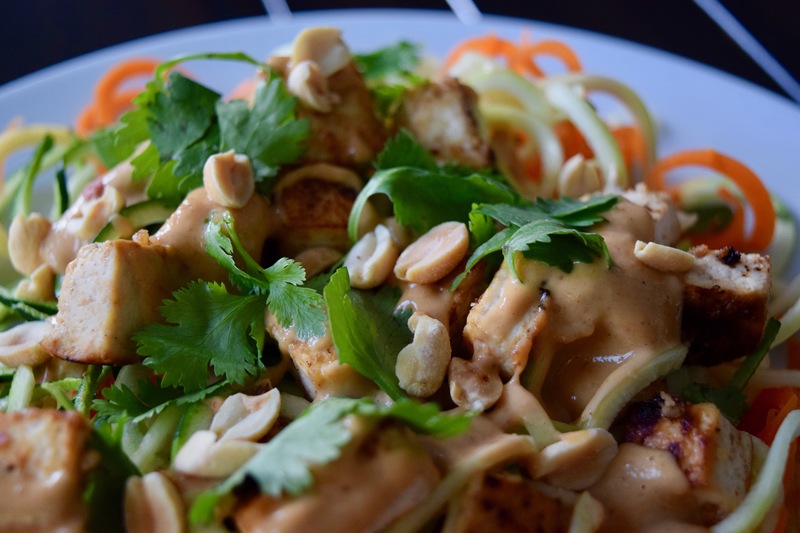 Top with peanut sauce, tofu, cilantro, and peanuts. Serve at room temp. Will be making this tonight!! I’ve never tried spiralized vegetables. I’ll have to give them a shot so I can try this recipe. Have to try this and I have all the ingredients in! Yay! i love it when that happens!!! !